The United Brethren Headquarters is undergoing a transition in the position of Finance Director. Janet Bilyew, our present Finance Director, will leave us at the end of July. Janet has worked at the UB Heaquarters since the early 1970s, longer than anyone else. She has accepted a position in Fort Wayne, just a few miles from her home. She will be greatly missed. Janet’s replacement has been found in the person of Jane Jordan. She is moving to the Huntington area, and started with us on July 19. Her husband is in the Navy and is being transferred from Seattle; he is about reach to begin a six-month submarine tour. Jane will be in the Huntington area for an extended period before her husband is then transferred to Virginia Beach. Tim Walberg, a layperson from the Trenton Hills UB church in Adrian, is running for the US Congress. Tim was a delegate to the 2001 US National Conference. Murray Stevens is the new pastor of Saint James UB in Mid-Atlantic Conference as of July 1. At the end of August, Rev. M. E. Burkett will step down from the active pastorate after 66 years in the ministry. He and his wife, Frances, will move to Florida for about nine months. He has served as a missionary in Sierra Leone and at the Laurel Mission, and has pastored churches in Canada and across the United States. Most recently, he has been pastor of the New Hope UB church in Huntington, Ind. Kanchoon Lee, pastor of The Forever Love Church, next to his church's sign. First UB (Findlay, Ohio) has been involved with a new church plant in Findlay. First, they parented the Faith Community Church in a mother-daughter situation. Now they are fostering a new Korean congregation. Because of the University of Findlay, the city has a large Korean population. Kangchoon Lee is a church planting pastor from Korea. He has planted two churches in Korea and is now planting a Korean congregation in the United States. He is partnering with First UB to start a new congregation called, in English, “The Forever Love Church.” Currently, the church is running around 12 individuals. Once school starts, the numbers will escalate. 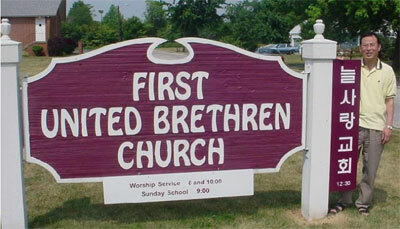 The First United Brethren Church is supplying the building, along with partnering in ministry. Also, First UB will provide an “English as a Second Language” course for the Koreans. This is very similar to the course that our missionaries teach in Macau. The Dewitt UB church (Dewitt, Mich.) is holding its final service on August 1. The pastor has been Rev. Ron Watterly. West Windsor UB (Dimondale, Mich.) held a surprise 90th birthday party for Rholland “Archie” Carpenter on Sunday, July 18, during the Sunday school hour. He still attends every Sunday, and can quickly recall Bible verses for any subject they happen to be discussing. Among the 44 people attending were 16 Carpenters, mostly cousins, nieces, and nephews of Archie. Archie and Cora Carpenter hosted the West Windsor church in their living room for many years before the current building was constructed. They are church patriarchs. Cora died a few years ago. Their daughter, Carol, who retired from school-teaching several years back, now takes care of Archie. He was the first Christian in his family, which included 11 brothers and three sisters. 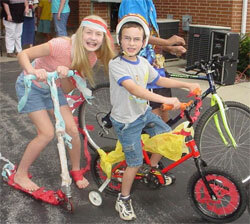 First UB of Findlay, Ohio, held its 4th annual community block party on Saturday, July 17. This concluded a week-long VBS that saw 14 decisions for Christ. In preparation for this party, individuals within the congregation blitzed the neighborhood with fliers and personal invitations. On Saturday, the church prepared games, food, and entertainment that was all 100% free to everyone. Individuals from the community showed up, and the next Sunday, one individual even visited the church. A growing number of UB churches run announcement loops prior to services–PowerPoint slides, shown via an electronic projector, which contain announcements and information about upcoming events, birthdays, etc. This is like the slides often shown in theaters before the movie. You have a captive audience, and people will watch whatever’s on the screen. It’s a good communication vehicle. Global Ministries has produced slides for all of our missionaries, as well as for a number of our international leaders and countries. These can be added to your announcement loop to help people become more familiar with the things we are doing in missions, and particularly with our missionaries. The slides are available on the website, and can be downloaded directly to your computer. Or, Global Ministries will be happy to burn a CD containing all of the slides currently available and mail it to your church. You can find the slides here.